ACR provides a wide range of computer support for domestic and business customers. 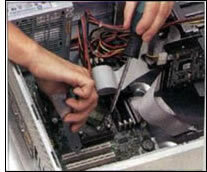 We are capable of dealing with most of your computer problems, whether hardware or software based. We carry out on-site and in-house repair, maintenance and installation work. ACR can also provide your computer with the latest anti spy-ware, ad-ware and virus protection. We have a range of workshop charges, as we have some fixed fees for regular types of maintenance and upgrade work. Please call for details. We provide on-site services on a contract or ad hoc basis. The charge for ad hoc work is a £27.50 excluding VAT callout charge** with a minimum on-site labour charge of £74.17 excluding VAT, plus parts. Jobs are arranged at a time to suit you and we endeavour to be with you as close as possible to that time, but occasionally we would need to make changes as our contract customers take priority. We will always contact you to keep you up to date with any changes. For more information on our services please call 01780 753477. **Callout charge not applicable to Stamford customers. The most popular option available for most businesses is to purchase pre-paid engineer time in bulk. This can be used for on-site, workshop or telephone support sevices. When purchased in blocks of 5 hours the labour rate reduces to £65.83 per hour excluding VAT and there is no call out charge. This option carries an 8 working hour response, where possible, and parts are additional. Pre-paid hours can also be used for software and hardware installations and the hours purchased do not expire after a year.